The problems caused by thatch buildup. 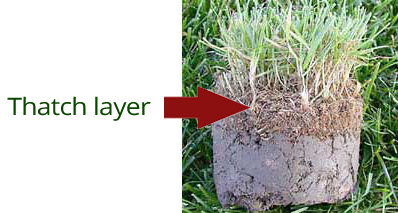 Thatch that is too dense, or too thick, can prevent water and nutrients from reaching the lawns root system. Instead, water runs across the top of the lawn, taking with it the natural Nitrogen that comes with rain, and potentially any minerals added by fertilizing and lime. Another big problem with thick thatch is it can be a great home for insects and disease organisms. This is often seen more heavily in the south, but can happen to any lawn. Using a de-thatcher or power rake every spring can do wonders for your lawn. These machines have special blades or tines that rotate vertically through your lawn, and pull up the thatch. These machines can also be great to prep a lawn for overseeding. Aerating annually will also help to reduce thatch, while providing other advantages. You can read more about aerating HERE. Thatch is much easier to remove when the lawn is very dry, so be sure to wait until the lawn dries out after spring break-up. Follow up dethatching with spring fertilizer, lime, and proper watering for a great looking lawn. Glaciers Edge Maintenance offers aerating and dethatching services to help your lawn. Dethatching is a part of our regular spring cleanups, and is highly recommended if it has not been performed in many years. Annual aerating will usually prevent the need for dethatching. You can request an estimate for aerating, or a spring cleanup HERE.